Roger Hilton is one of the most unique voices in post-war British art. 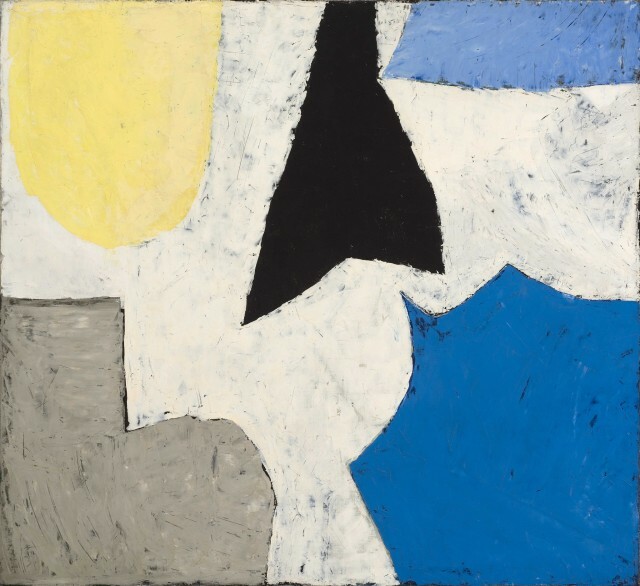 Often associated with the 'middle generation' of St Ives painters - Frost, Heron, Lanyon, Wynter - he spent much of his career in London, where his work was deeply influenced by European avante-garde movements such as tachisme and CoBrA. In 1965, having just represented Britain at the Venice Biennale, Hilton moved to Cornwall, where his working routine began to break down, mainly as a result of his increasing addiction to alcohol (which he had long used to creative effect). Despite being bedridden for the last two years of his life, he continued to work, painting over the side of his bed on sheets of paper laid on the floor. His gouaches from this period are at once brutal and tender, raw and naïve yet often conceived with the utmost artfulness. Major retrospectives of Hilton's work have been held at the Serpentine Gallery (1974), Hayward Gallery (1993) and Tate St Ives (2006) and his work is represented in major museum collections throughout the world.